Top 5 Reasons Small Businesses Owners File Insurance Claims | The Voss Law Firm, P.C. Small business owners are often worried about protecting themselves against customer injuries due to slip and falls or product liability. While these claims may be expensive— and are definitely worth the cost of insurance—they are not the only perils that face owners of small and medium businesses. Attorney Bill Voss explores the biggest property damage risks to small business owners, and how to make smart coverage options to protect your profits. The Hartford, a major insurance provider, released a report that analyzed over a million commercial insurance claims over a period of five years. The results showed that the most common claims are not always the costliest, but they can quickly add up and cause major business losses. Business income loss. The most expensive claims resulted from damage to the business's reputation, an average cost of $50,000 for each claim. While owners can invest in liability insurance specifically to cover reputational harm, he or she may also be able to recover lost income during this period by selecting business income replacement insurance. Fire. Although fire claims cost an average of $35,000 over the course of the study, there is no telling how much damage a fire will do until after the flames have been put out. 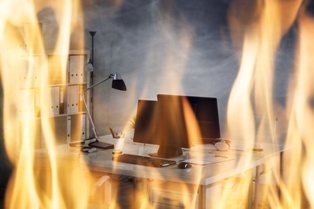 Business owners should have a comprehensive fire policy, as well as install fire detection and suppression systems to reduce the chances of a blaze. Wind and hail. Small business owners suffered an average of $26,000 in wind or hail damage to structures, inventory, outdoor signage, landscaping, and other commercial property. Water damage. Water intrusion and freezing damage cost small businesses an average of $17,000 from probate insurers, but this number is considerably higher for floods caused by natural disasters. Theft. While one out of every five claims in the report was due to burglary or theft, the average cost of these claims was around $8,000, making it the least expensive of the perils in the study. If you are having trouble getting an insurer to cover the costs of damage to your business, we can help. Simply fill out the form on this page today to contact the Voss Law Firm or order a free copy of our book, Commercial Property Owners Must Read This BEFORE Filing an Insurance Claim.